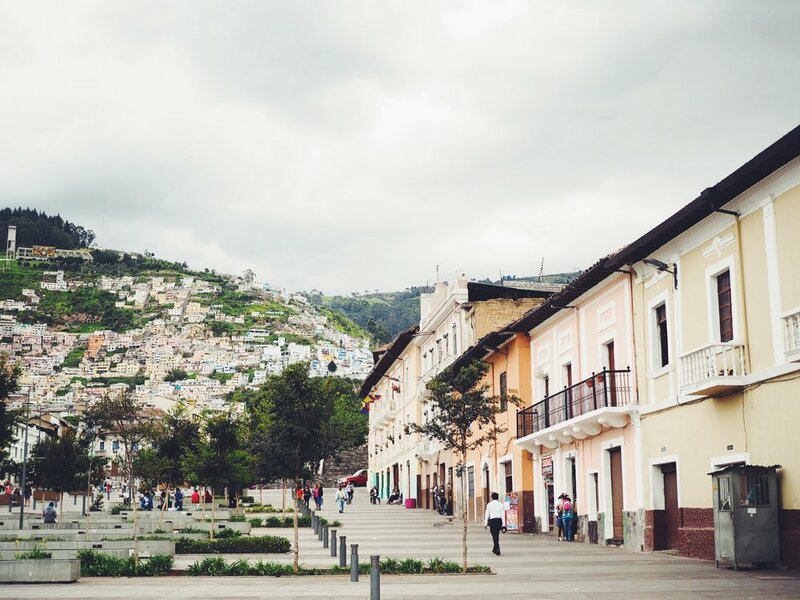 The Ecuadorean capital was to be our penultimate stop before entering Colombia, we hadn't heard amazing reviews on Quito, there were a few things we were excited to experience in and around the picturesque city centre. Getting there from Montañita was fairly straight forward, and although the buses in Ecuador were definitely not the same standard of comfort compared with other South American buses, we still managed to get some sleep on the 10 hour night bus after changing at Santa Elena. We arrived in Quito at 7.30am, and got in a cab straight to Hostel Revolution, a place we had been recommended by Marco and Angelina, a Swiss couple we had met on our Galapagos cruise. We opted for a private room, which was needed after a long tiring journey. The hostel itself was beautifully clean and run by a Dutch lady who was very informative on things to do in and around Quito, including getting to the Middle of the World site and Otavalo market. That evening we headed to Bandido Brewing, an old church that had been converted into a bar serving great beer and tacos. The following day we headed into the beautiful historic city centre where we visited the lively Plaza de la Independencia, the Plaza de San Francisco and the many churches around the area. We went for a quick coffee at Cafe del Fraile on the second floor of the very quaint Centro Comercial Palacio Arzobispal, before heading to the amazing gold-clad Iglesia de La Compañía de Jesús ($5 entry, no photography!). 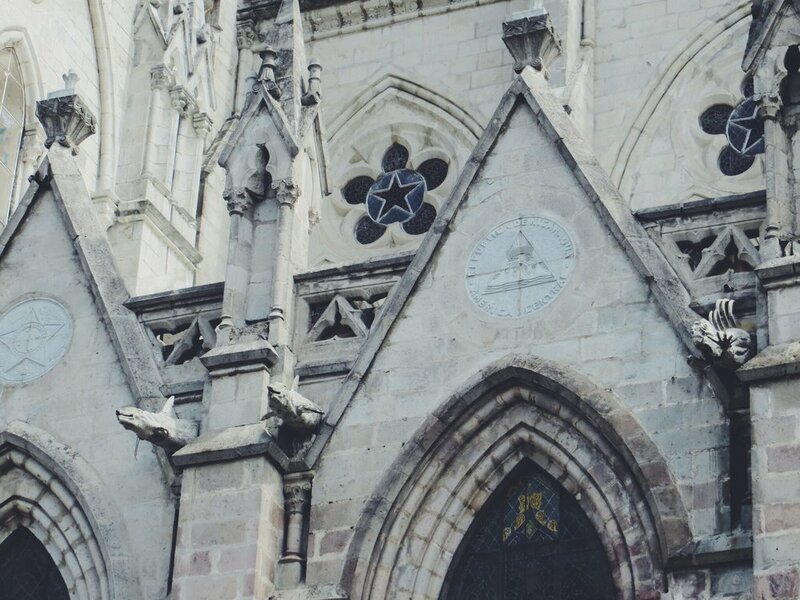 We finished our Quito church tour with the impressive Basilica del Voto Nacional, a 19th-century church featuring ornate neo-Gothic styling and Amazonian gargoyles depicting sharks, monkeys, jaguars and other iconic species. We then wandered through the colourful cobbled streets of the old town, including Calle La Rhonda, which was filled with craft shops and cafes. After a morning of exploring the centre of Quito we decided to venture into the Mercado Central for a traditional but fairly basic (and cheap!) Ecuadorian lunch of rice, chicken and soup. After lunch we walked to the commercial centre of Quito, which was more edgy than the historic centre, but had a nice park to wander through on the way back to our hostel. 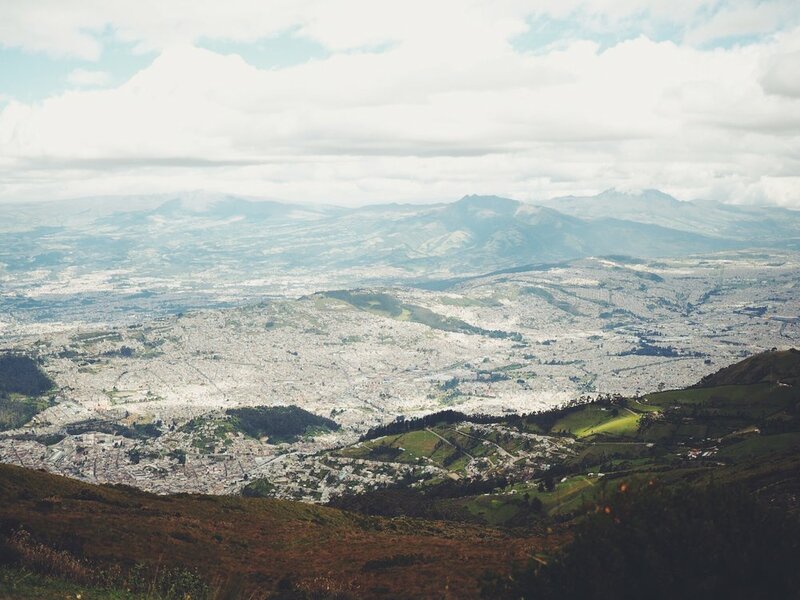 The following day we decided to visit one of the main attractions of the city: the Teleferico De Quito that takes you from the edge of the city centre up to the panoramic lookout point on the east side of Pichincha Volcano. To get there we took a taxi (which was advised) to the base of the cable car where we bought our tickets to the top. The ride took about 20 minutes, where we were given an incredible view of the expansive city that stretched across the long valley as far as the eye could see. It was a lot colder at the top, being 3,945m above sea level, and so we made sure we wrapped up with warm layers before walking around the top and taking in the views. By chance, we bumped into the Swiss couple Margot and Flo who we had met on multiple occasions (including the Galapagos and Montañita), and so enjoyed catching up with them before travelling down together and sharing a cab back to the centre. Ecuador is given its name due to its geographical location (literally on the equator) and so it would be rude not to visit the site which celebrates it's location at the middle of the world. Getting to 'The Middle of the World' from the city was a bit of an effort, requiring two busses through the busy centre and taking around 2 hours each way. On arrival we entered the site and headed toward the Ciudad Mitad del Mundo, a huge iconic monument that marked the equator line. We headed to the top to get a great view of the surrounding area where we could see the North, South, East and West marked on the floor and the equator line running through the middle of the monument. On the way down from the top we visited the exhibitions on each floor inside the monument, including a Science Museum which explained the effects of gravity at the middle of the world through interactive models, diagrams and videos. We had heard that the Ciudad Mitad del Mundo wasn't actually on the true equator line, and so we walked around to find what we thought was. We later discovered that we had missed the actual spot, which for future reference can be found inside the Intinan Museum (about 5 minutes from the 'official' site) where you can balance an egg on a nail due to the equal gravitational forces present at the middle of the world. 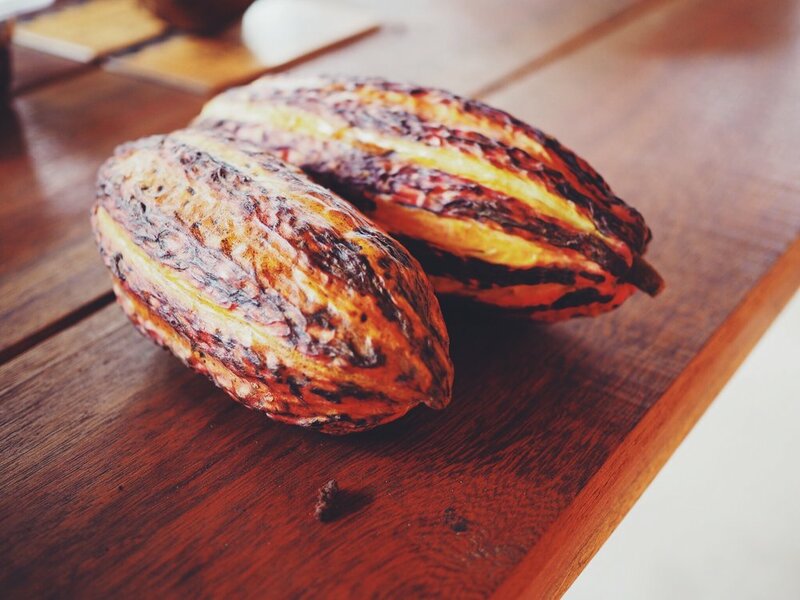 After a quick lunch at one of the tourist restaurants we headed over to the chocolate museum to learn about Ecuador's coco trade, and the processes of how coco beans are turned into chocolate. It was a nice end to our time in Quito, and after heading back to our hostel we arranged travel to the bus station so we could visit Otavalo, home to one of South Americas most impressive markets. Being one of the largest indigenous markets in South America and on the way to Colombia from Quito, Otavalo market was an obvious stop for us, particularly as we happened to be visiting on a weekend when we would catch it at its most bustling. To get there we took a taxi to the Terminal Norte in Quito centre and then took a 2 hour bus ride to the town of Otavalo. We had decided to stay the night so we could be up early to see the animal market. We checked into the Flying Donkey hostel in the centre of town before exploring the local area, grabbing a coffee at the surprisingly stylish La Cosecha Coffee overlooking Plaza de Ponchos, the main market square. The following day we woke early and headed to the animal market on the outskirts of town. Just before we got there we noticed the crowds of people gathered in front of the main road, all congregating to get he best deals on chickens, pigs, cows and other livestock. After wandering around the animal market we headed back to Plaza de Ponchos where the main market stalls were now in full swing. We had amazing roast pork and potatoes breakfast (typical in Ecuador) cooked by one of the local ladies, giving us the energy we needed to explore the many popup craft stalls that filled the entire town of Otavalo. The market had a huge variety of produce, from fresh vegetables and grains to indigenous handicrafts such as masks, jewellery, clothing and textiles. It was a colourful feast for the eyes, and being there early meant we beat the majority of the tourist crowds which gave us a much more authentic experience of the market. We really enjoyed wandering through the narrow alleyways crammed with stalls and picking up a few gifts and souvenirs. By mid day the area had begun to get a little too crowded, and we'd seen all we wanted to see, so we decided to head back to the hostel, grab our bags and head for the bus station. Getting to Colombia from Otavalo was a little more complicated than most border crossings we had done on our travels so it took us a bit of navigating and asking around. After some help from the locals we eventually managed to find the bus from Otavalo to Ibarra, where we took another bus to the boarder town of Tulcan. From there we had to take a cab (the only way to reach the border) and cross over to Colombia by foot. Having spent the majority of our time in Ecuador in the Galápagos Islands meant that we missed out some things we had wanted to do, such as Cuenca, Cotopaxi and Banos. It was a tough call to make, but felt that at this point in the trip we had to prioritise and allow for more time in Colombia, a country we were very excited to visit. Having said that, we had a great time in Ecuador, from whale watching in Montañita, visiting the beautiful historic centre of Quito and exploring one of South Americas biggest markets in Otavalo, we left feeling satisfied that we’d managed to fit in such memorable experiences before heading onwards on our travels. After an incredible 12 days exploring the Galápagos Islands, we wanted to have some down time to relax and reflect on our experience, and plan our next movements further north. We decided to skim through Ecuador as we were keen to get to Colombia, but we had heard good things about Montañita, a small surf town 4 hours west of Guayaquil, and so decided to stop there for a few days. After getting our flight back from Baltra airport to Guayaquil, we had an afternoon to kill before getting our bus to Montañita, and so we jumped in a taxi and headed into the centre of Ecuador's largest city. Our first stop was the Parque de las Iguanas, a small square located in the Seminar Park in front of the Metropolitan Cathedral of Guayaquil and surrounded by grand buildings. As the name suggested the park was teaming with large green iguanas, as well as terrapins bathing in various pools. Many iguanas were hanging in the trees, and so we had to be careful not to get hit by iguana poop as we wandered around! It was great being able to get so close to them, take a few snaps, and watch the locals feeding them with lettuce leaves and bananas. We then wandered through the city centre towards the waterfront of the Rio Guayas, and headed towards Las Penas, the colourful, artistic district of the city. To get there we wandered along the river front passing through various parks with water features and tropical plants. Once we arrived we headed up the steep roads past brightly painted walls, rustic doors and shutters (and many armed guards!) until we reached the lighthouse at the top of Cerro Santa Ana. At the top we started chatting to two local guys from the city called Juan and Julio, who were really friendly and kindly offered to give us a short tour of a few key spots around the city centre. 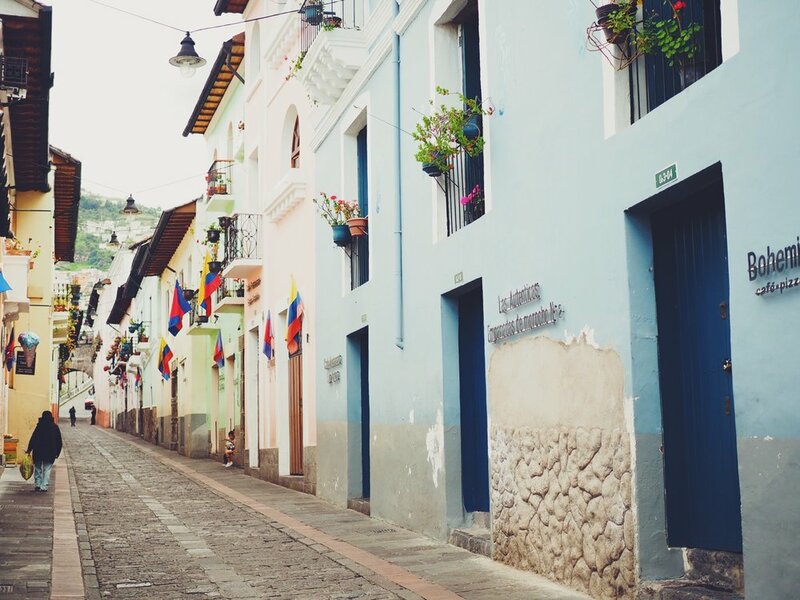 We spent a few fun hours getting to know Juan and Julio, and visited their favourite local juice bar, a historic clock tower, handicraft markets and a cheap but decent spot to try traditional Ecuadorian food. In return, they quizzed us about lots of English words, as the were keen to learn 'English English', rather than 'American English'. We had heard that Guayaquil wasn't the safest city to visit, so were surprised to find such generous hospitality. That being said, we were glad to have a local show us through the more edgy parts of the city, pointing out when to be wary of pick pockets. After an interesting afternoon of exploring Guayaquil it was time to move on, and so we headed back to the bus station around 6, and took the 3-hour bus west to the costal town of Montañita. 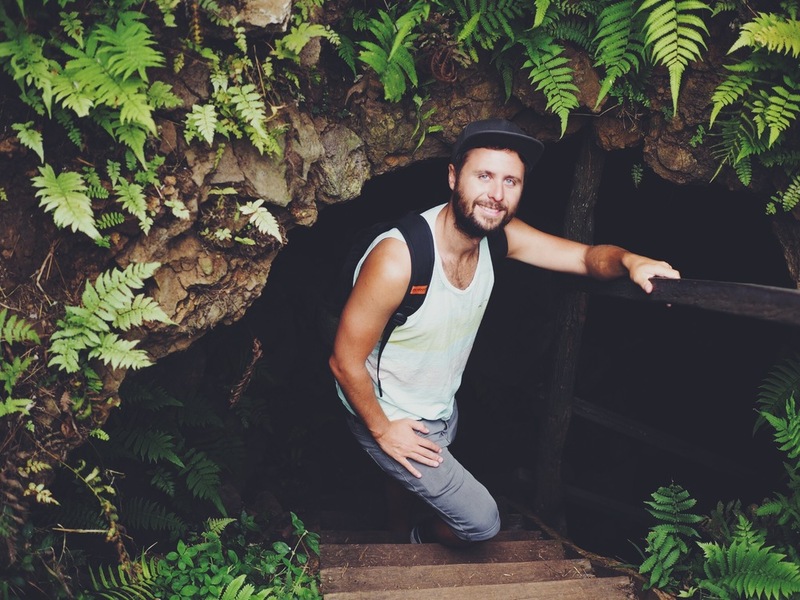 After arriving at the bus station we jumped in a cab and headed a few kilometres up the coast to Kamala, a lively hostel run by Anna and James, an Aussie and a Brit who'd met on their travels and decided to run the place together. There was a large bar area where they served chilled beers and home cooked food, a huge pool and a friendly vibe, so as we settled in we looked forward to spending a few days there to chill and enjoy some down time. The beach was literally 20 meters away from the hostel, making it ideal to go for a quick swim (when the waves weren't too big! ), or stroll down the coast along the sand to get to the town. The following morning, after a hearty breakfast of fruit and pancakes, we wandered down the coast to the centre of town to suss it out. Our fist impression of Montañita was that it felt a little tacky, but it definitely had a fun atmosphere and seemed like a great place to have a big night out. We stopped for lunch at a small restaurant and ordered the 'menu de dia' to keep things cheap. Whilst walking through the town we noticed how many birds were perched on the electricity cables - literally thousands - meaning you had to be careful not to get showered when walking underneath, and many of the locals walked around with umbrellas as a precaution! That afternoon there was a pirate party kicking off at Kamala hostel, and so after a few beers and shots of rum we all headed out into town for some cheap cocktails. We had heard that the best club to visit was 'Lost Beach Club', and we all ended up there and danced into the early hours. During our stay at Kamala the owner Anna had spoken to us a lot about the Manta Rays that were visiting the area, and having not seen them herself was very keen to arrange a diving trip. The odds of spotting them were apparently very good, and having always wanted to dive with Mantas we were easily persuaded to sign up. After waiting for a few days for the right conditions we were up early and drove about half an hour south to the small town of Ayangue where we met up with her friends who worked at Ray Aguila dive outfit. We visited two dive sites that morning and whilst we did see lots of fish, sharks and corals, as well as hearing humpback whales underwater, unfortunately we did NOT spot the ever elusive Mantas! 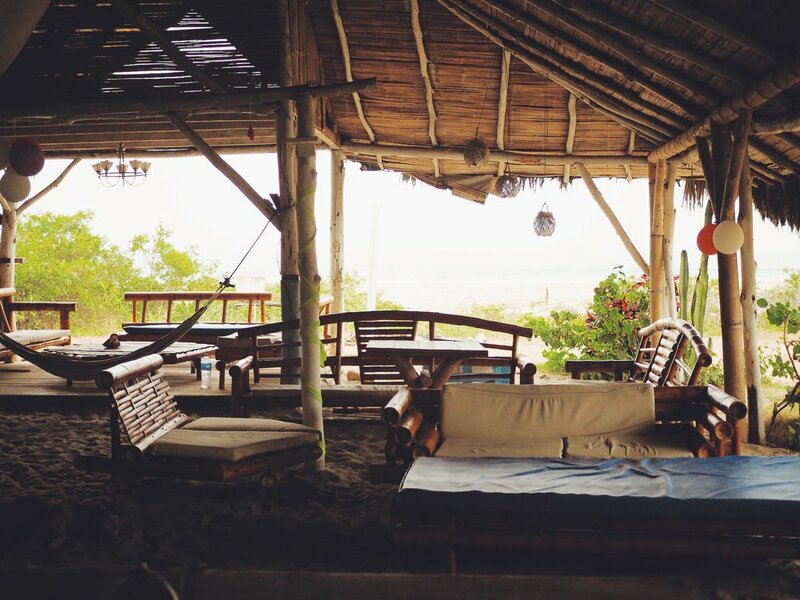 One of the most popular places to visit from Montañita is Isla de la Plata (also known as the 'Poor mans Galápagos') situated off the coast of Puerto Lopez, a town not far north from our hostel. Having just been to the Galápagos Islands we felt it might be a bit of a disappointment, but we had been told it was humpback whale season and spotting them was pretty certain on the journey there and back. By chance we bumped into the lovely Swiss couple who were also on our Galapagos cruise, Flo and Margot. As neither of us had seen whales during our cruise we were all excited to have another chance, and so they headed to Kamala hostel (who had organised the trip for us) and joined our group. After an hours drive we arrived at the small seaside town of Puerto Lopez. The docks were filled with fishing boats, attracting many pelicans, and after being introduced by our guide we all piled into a boat and set off from the port towards Isla de la Plata. We were told by our guide to keep an eye out for whales on the way, and so our group were fixated on the deep water with cameras at the ready as we headed towards the island. After about half an hour we spotted our first whale on the horizon, but unfortunately it was too far away to see properly. We spotted a few others again in the distance but they all seemed to disperse, and our captain explained that we'd have a better chance on our way back. We arrived on the Island around 11am, and were organised into 2 separate groups. After a bit of waiting around our guide led us up the path to the top of the hill, and began to explain about dry climate and conditions on the island, and how it affected the vegetation and wildlife. 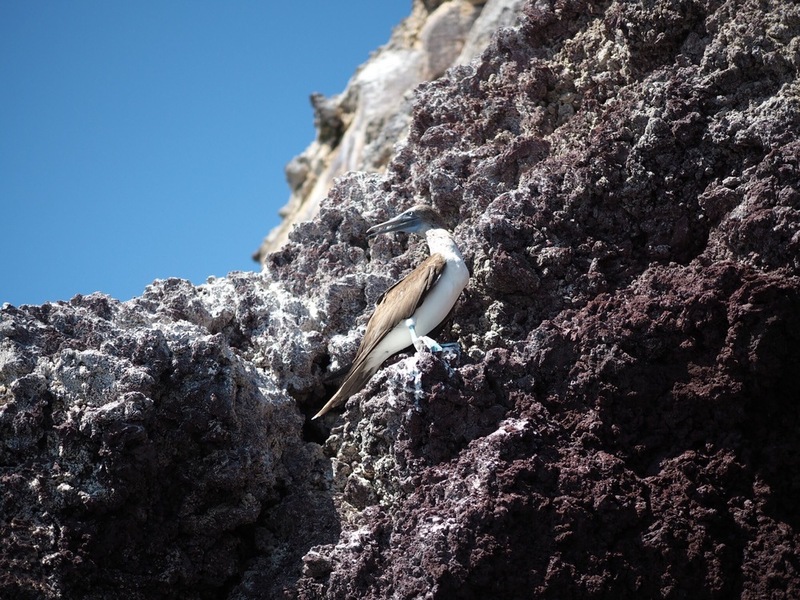 Once we got to the top we spotted a series of nests belonging to the Blue Footed Booby, birds we had seen a lot of on the Galápagos. The novelty of their brightly coloured feet still hadn't worn off for us, and we enjoyed watching each couple perform their typical mating dance accompanied by whistles and squarks. We continued further to the edge of the island and stopped at a huge cliff face that looked out over the ocean. There were many birds nesting and flying around the cliffs, including tropic birds, Nazca boobies and frigates. Our guide explained the meaning behind the name of the island - Isla de la Plata - meaning Silver Island. This was due to the colour of the ground covered by thousands of bird droppings. This created the illusion of a shimmering silver island for boats looking from a distance. We were also told that the fertile soil created from the droppings was incredibly sacred and valuable during inca times, and trespassing in these areas could be punishable by death! After walking back to the boat we were told we had some snorkelling time, and so we headed a little way up the coast to a spot which we were told had beautiful corals. Unfortunately once we entered the water we realised the visibility was really poor, and so found it hard to spot anything in the silt-filled water. We did managed to spot a sea turtle, a small Ray and some tropical fish, although most of the footage wasn't clear enough to make out. We then got back into the boat and had a quick sandwich and banana before making our way back. The journey back was our last shot at seeing humpbacks, and our guide told us we would be better prepared to find them this time. After half an hour of travel the captain signalled that there were whales in the area, and so we kept our eyes peeled looking for any activity in the expansive blue ocean. We started to notice large shadows moving beneath us, and some whales started to rise above the water level showing their tails and dorsal fins. There must have been about 6 in total, and we kept a look out, doing our best to capture the incredible animals on our cameras. Then suddenly not far from the boat a huge whale breached right in front of us, making a dramatic splash of white water as it landed. It was incredible to witness one of the largest mammals on earth at such close range, and in such numbers. After about half an hour of watching the whales jump around our boat we headed back to the mainland and ended our tour. We found that Montañita was the perfect place to help us mentally recharge, research and plan the next stint of our travels. We met some great people at Kamala Hostel and took advantage of the parties in and around the town, but also welcomed the down time by the pool sunbathing (and nursing hangovers!). We were also able to witness some fantastic wildlife, and seeing humpback whales so close was definitely something to tick off our bucket list. After 5 days by the beach we were excited to be heading onwards to Quito and within the week, arriving in the much anticipated Colombia. Having already spent an incredible 6 days in and around Santa Cruz island, we had already seen our fair share of wildlife and beautiful Galápagos landscapes. However, a cruise was the thing that we were most looking forward to, as we had heard it’s the best way to experience what the islands have to offer. Due to the high prices of Galápagos cruises, and not being a place you visit very often, there was a bit of pressure to get it right first time. In order to do this we spent a good few days visiting different tour agencies to discuss last minute deals and routes before committing to anything. 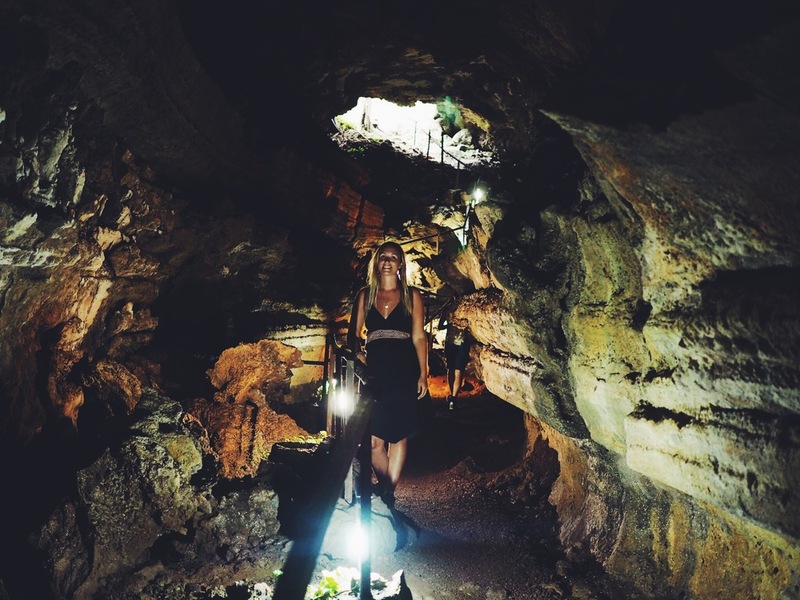 Unless you have the luxury of going on a 16 day cruise to see it all, most people have to make the tough decision of visiting either the Western islands of Isabela and Fernandina or the Northern and Southern Islands of Genovesa and Española. Both routes offer the chance to see different endemic species so it ultimately came down to what we wanted to see and experience. We found the decision making a little stressful, especially when you are about to part with a huge chunk of travel budget, but we knew it would be more than worth it. We decided to visit the Western islands, as they were more remote and would offer more varied terrain as well as the chance to see flamingoes, flightless cormorants, marine and land iguanas, turtles, sharks and potentially whales and penguins as in parts the water was much colder. Once we were set on a route we looked for boats that offered our preferred itinerary at the best price. However, if you chose a very budget boat you often get a budget guide and itinerary, so we were advised not to go for the cheapest option to avoid disappointment. After much deliberation and with various options ranging in price, itinerary and class, we decided to book with Moonrise Travel (a very helpful agency based on Charles Darwin Avenue) and opted for the Eden yacht: a ‘tourist superior’ class boat that sleeps 16 people. The boat had 8 double rooms, an onboard chef, a bar, a sun deck, and even hot showers, so we couldn't have asked for much more for the price. Another bonus was that the Eden offered us a 5 day/5 night cruise, meaning we would board the night before giving us more time. We boarded the boat at 8pm, and after meeting the rest of our fellow cruise members we sat down for our first delicious meal prepared by the chef. Our guide David then gave us a full brief of the next days itinerary, including what wildlife we were likely to see, so we felt well prepared as to what to expect before heading to bed. Our cabins were a decent size, with twin beds, a separate bathroom and plenty of storage. The only down side of our room was that it was positioned right next to the engine! Luckily our travel earplugs came to the rescue, and so we still got a decent nights sleep. After navigating at night we work up in Puerto Villamil, a small coastal village located in the south of Isabela Island. Following an amazing breakfast of fresh fruit and pancakes we prepared our day packs and our group set off to the town in 2 small dinghies. Our first stop was the wetlands, a short shuttle bus ride to the west of the town. 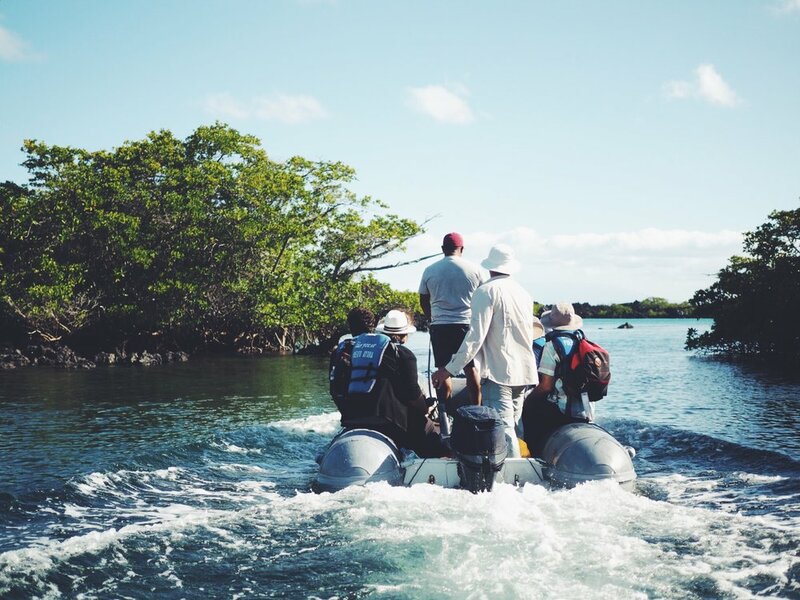 We were led by our guide David through mangrove forests and small sandy beaches where marine iguanas were basking in the sun. We were then shown a series of lava tunnels, and it was fascinating to hear how they had been created by a flow of hot lava that passed underneath the cooler crust during volcanic eruptions around a million years ago. We then headed back to the port and walked along a short boardwalk to Concha de Perla, a great snorkelling spot nearby. After side stepping iguanas and sleeping sea lion pups we reached the small sheltered bay. The pool was ideally located for marine life to feed at high tide, meaning we could spot rays, sea lions, marine iguanas and various tropical fish with ease. After an hour or so of snorkelling we headed back to the boat for a hearty spaghetti bolognese prepared by the onboard chef. Next on the agenda was a trip to the Arnaldo Tupiza tortoise sanctuary, so after taking the dingy to shore we got back on the shuttle bus and headed north of the port. Having already visited the Darwin centre on Santa Cruz we weren’t sure if we were going to see anything different. 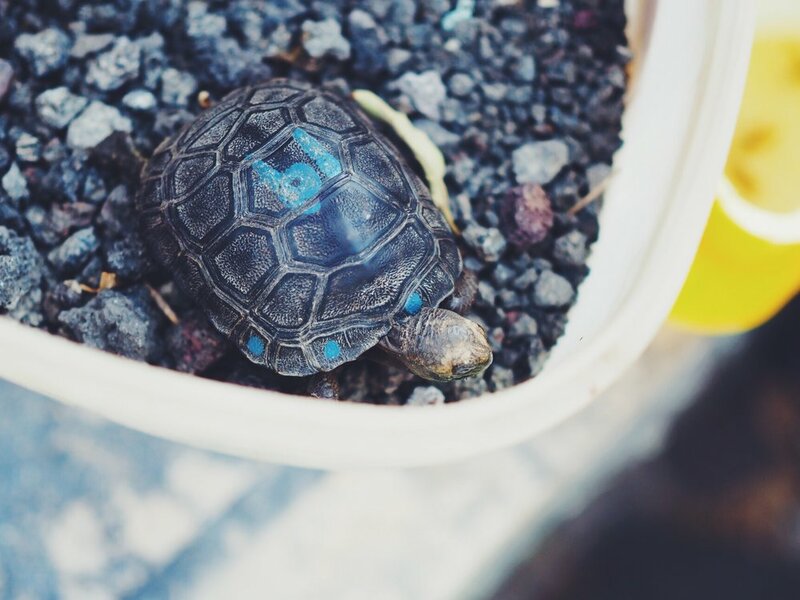 However, with David as our guide we learnt far more then we expected, and saw the interesting growth stages of the tortoises in small bottles, as well as the eggs and incubation processes. 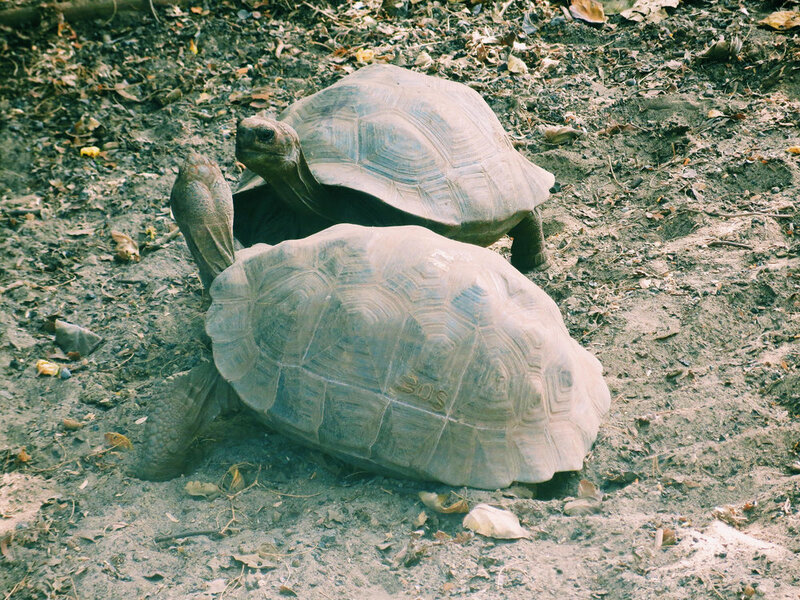 We even managed to see a couple of dominant male tortoises fight it out and try to roll each others shells over! 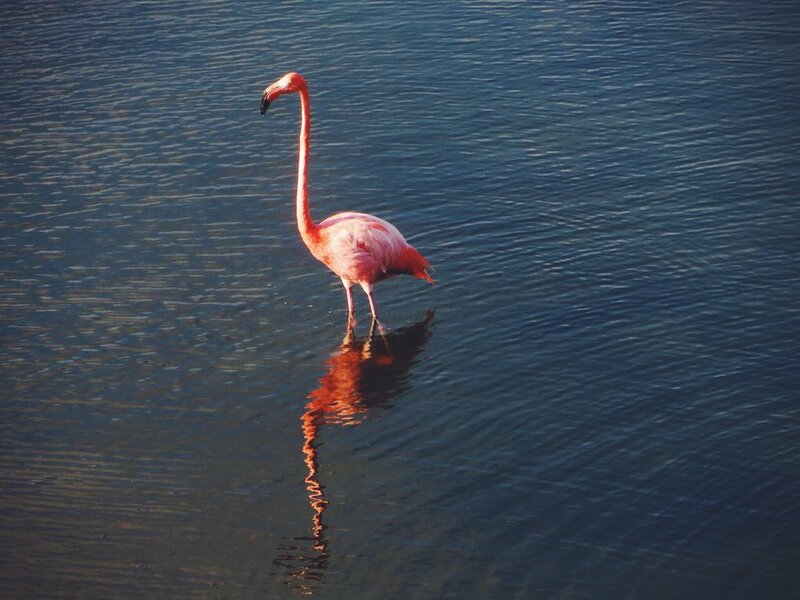 A short walk from the tortoise sanctuary was a small lake where we caught our first glimpse of the Galapagos flamingo. After seeing the James and Chilean flamingoes in Bolivia it was very interesting to see how much longer the Galapagos’ flamingos neck were, and how much brighter pink in colour they were. We stayed watching the flock for around half and hour as they fed on the tiny crustaceans that gives them their colour. The day ended back at the beach in Puerto Vilamil. We swam, lazed with the sea lions and iguanas and grabbed a beer with just enough time to watch the sun go down with our fellow ship mates. It was the perfect end to our first day on our Galapagos cruise, and after boarding the boat we spent the evening eating, drinking and discussing the itinerary for the following day. We woke in the morning to find ourselves in Moreno Point, a remote spot to the west of Elizabeth bay now far away from civilisation. After another hearty breakfast we boarded the dinghy and within a few minutes were dropped on the edge of a huge lava field. The black, rippled texture was like nothing we had walked on before, and David explained how the entire area was created by the volcanic lava that spread out for miles from Volcanoes in the distance. After walking carefully along the fragile rock we arrived at a series of small pools surrounded by grasses. The pools were connected to the sea through lava tunnels, and we were lucky enough to spot a turtle and a white tipped reef shark swimming in the clear shallow pools, trapped by the outgoing tide. After an interesting hour exploring the lava fields we got back on the boat for a quick snack before heading off to our first official snorkelling destination of the cruise, just off Moreno Point. The water was much colder than in Santa Cruz or Puerto Villamil, and so we were glad to have wetsuits. The visibility wasn’t fantastic due to the silt and strong currents, but the marine life was incredible. 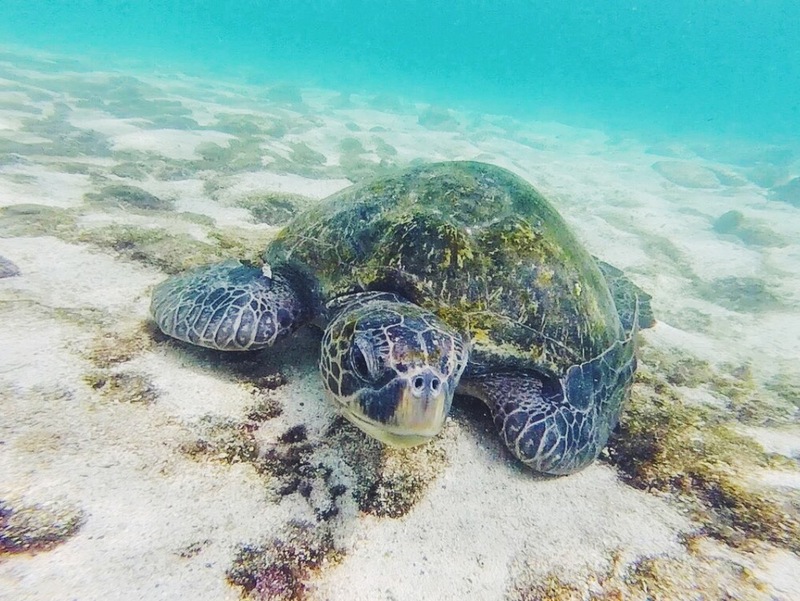 At one point we were surrounded by as many as seven friendly green sea turtles feeding on seaweed! After exploring the cold water for as long as we could, we got back on the boat and headed to the front sundeck to warm up in the sun. We started chatting to Angelina and Marco, a lovely swiss couple on a similar trip to ours. After about 5 minutes of chatting about the snorkelling they revealed that Marco had just proposed under water using a slate! After much excitement, hugs and congratulations we headed to the bar to order a round of piña coladas and spent a fun hour celebrating the exciting news. We cruised for another few hours over lunch, and pulled up around mid afternoon to our next spot, Elizabeth Bay. We boarded the dinghy and made our way there, stopping at various spots on the way to see wildlife. We spotted a sea lion dozing on the rocks, who gave us a big yawn and then clumsily made his way down to the water. He then swam beneath our boat, clearly showing off his aquatic skills in the glistening water! As we edged around the rock further we spotted a lone Galapagos penguin, a bird we had been eager to see. We learnt that it is the only wild penguin to live North of the equator due to the cold Humboldt current that flows from Antartica, making a perfect environment for them. As we journeyed to deeper waters we spotted a whole group of penguins leaping out the sea! It was an amazing thing to witness, and we sped along side them for a while before they darted off in different directions. We then spotted a flightless cormorant basking in the sun, totally unphased by our boat, so we were able to get some great pictures. We had learnt that due to the lack of natural predators on the Galapagos, the flightless cormorants wings had evolved to become smaller due to its lack of necessity to fly. This also makes them more streamlined in water when fishing. As it was one of the unique Galapagos species we had read lots about we were really pleased that we got to see one so close. 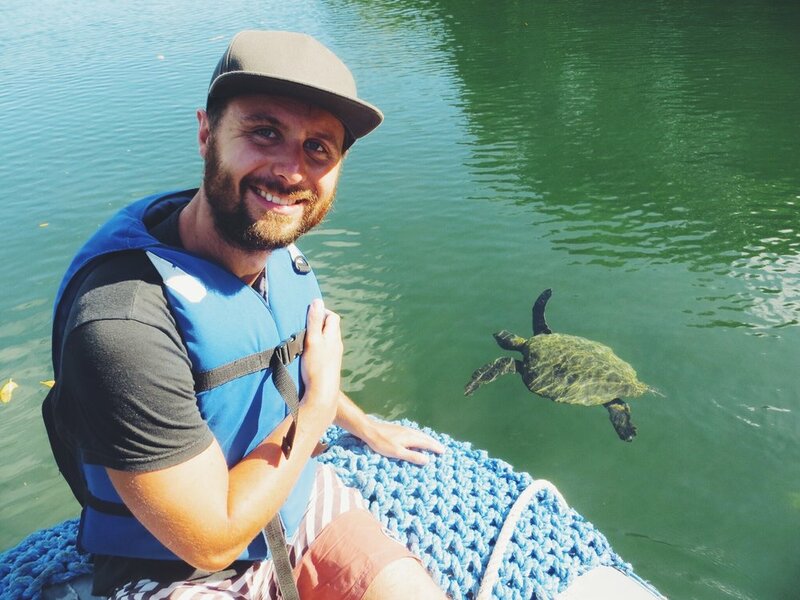 We finally arrived at Elizabeth Bay, and as we slowly approached the sheltered waters surrounded by mangroves we spotted many turtles popping their heads up for air right next to the boat. We approached a narrow, shallow inlet, and our guide David said we needed to keep our eyes on the water and after a short wile we spotted a shoal of juvenile golden rays glimmering near the surface! They slowly drifted underneath our boat, and we managed to lower the GoPro into the water to get a better view. It was mesmerising to watch, and probably one of our favourite moments of our cruise. 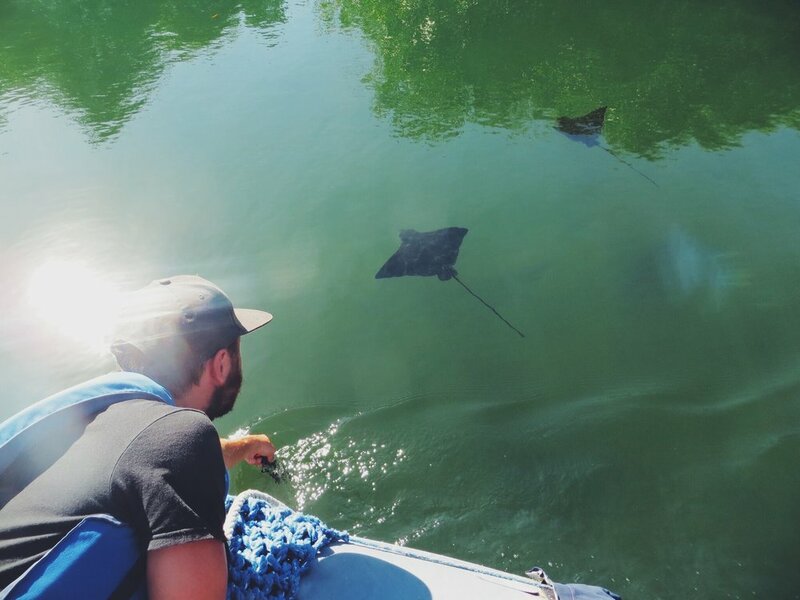 After ten minutes following the golden rays we headed up into another shallow inlet where we found another group of rays, this time baby spotted eagle rays, calmly floating in the crystal clear water. We followed the shoal for a while, bumping into many turtles and sea lions fishing amongst the mangroves. With the sheer abundance of marine life around us we were completely blown away by Elizabeth Bay. 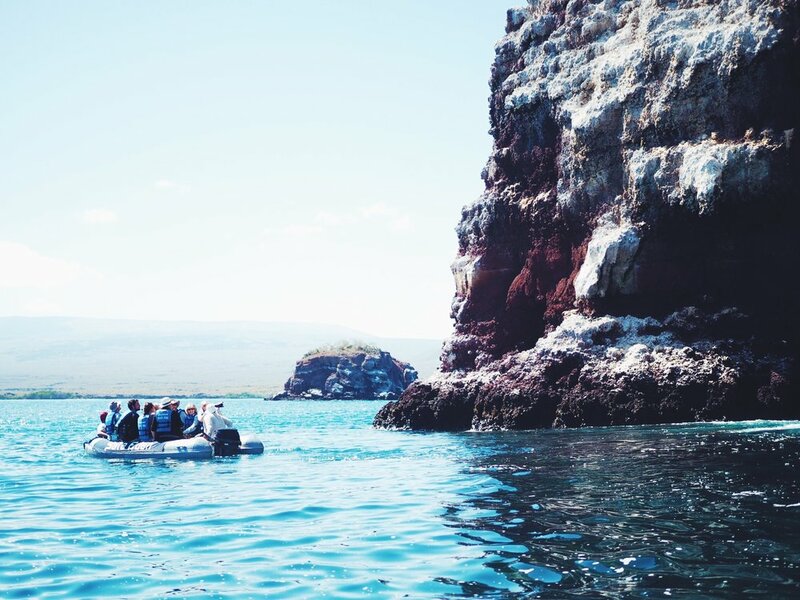 What made it more special was that we were the only group there, and we were really pleased we'd chosen to explore this side of the Galapagos. After an unforgettable few hours we headed back to the boat where one of our fellow cruise members, Raj, treated the group to a bottle of champagne to toast Angelina and Marco’s engagement. We settled in to another delicious dinner, and chatted about the amazing wildlife we'd been so lucky to see throughout the day. We were then briefed by David on Day 3 of our cruise, which sounded equally exciting. The next morning we woke up in Tagus cove, a small bay famed for Pirate moorings due to it's sheltered location. On landing, we spotted graffiti on a large rock, but on closer inspection we noticed that they were old name carvings from sailors/pirates, some dating back to 1836, adding more intrigue to the history of the island. As we were jumping off the dinghies we noticed that a couple of flightless cormorants had nested in the middle of the walk way. They seemed completely comfortable with all the groups having to side step around their carefully guarded eggs, and we did our best not to disturb them as we passed. The surrounding landscape of Tagus Cove was very dry and baron, and felt quite different to the other parts of the island we'd visited. After a small trek up the hill we reached the look out point where we were treated to a gorgeous view of a blue-green crater lake. 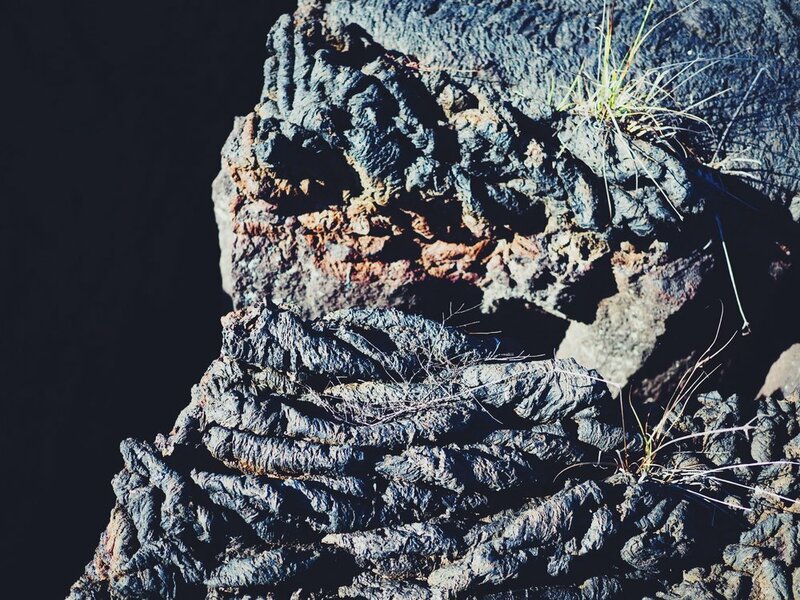 We had learnt that all the Galápagos Islands had been created by volcanic eruptions from under the sea millions of years ago. Now many had either sunk entirely or were in the process of sinking, and it was great to see a prime example of this process first-hand. We then made our way back to the boat and changed back into our wetsuits for another snorkelling session in the cove. Again the water was pretty cold but with large puffer fish and flightless cormorants swimming amongst us we were glad we had braved it. We got back on board for some lunch and the Eden then navigated towards Espinoza Point on Fernandina island. 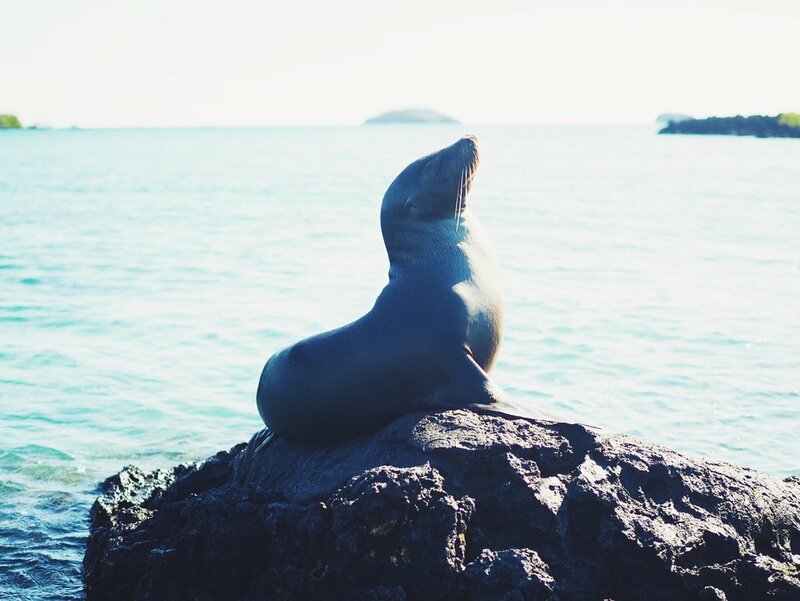 Fernandina is the third largest, and youngest, island of the Galápagos Islands and with it’s remote location was another perfect spot for both land and marine wildlife. Not long after we landed and had made our way onto the beach we spotted another of the endemic species - the Galapagos hawk, perched on top of a low tree so we got a really good view. As the island is teaming with marine iguanas and small snakes the hawk had a good food supply on tap. 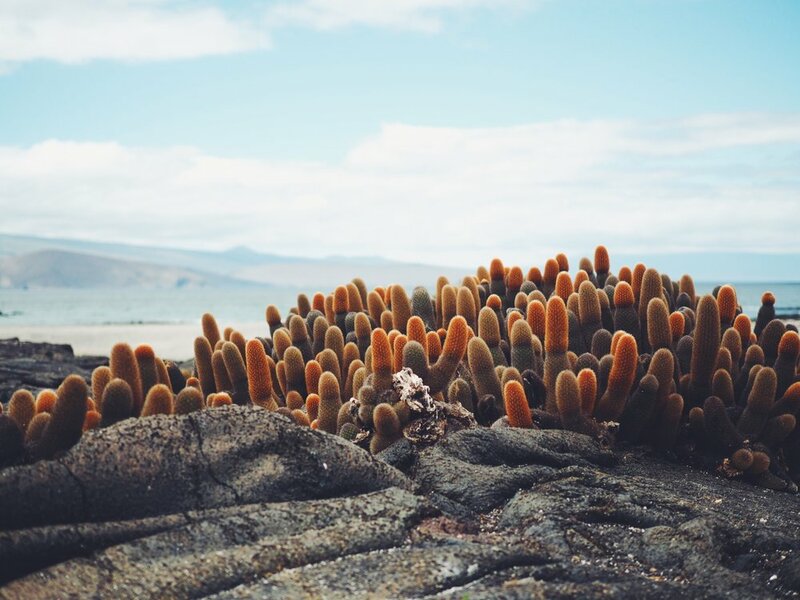 As we wondered across the beach towards the lava fields we spotted clusters of the unusual looking lava Cactus with a beautiful island backdrop. 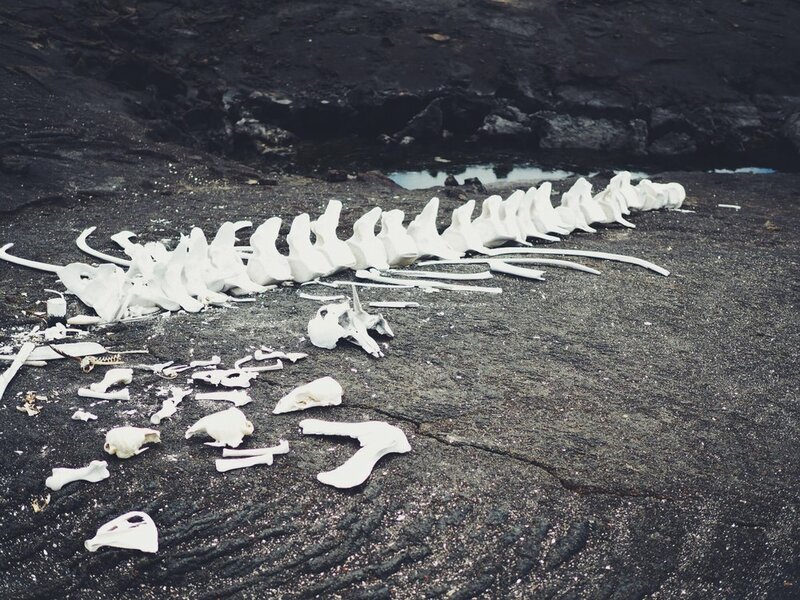 As we wondered further we noticed that there were a number of skeletons bleached white against the black lava. Having watched the David Attenborough series recently, we had learnt that during the El Niño weather system, the right type of seaweed fails to grow meaning that many iguanas die, particularly the large ones. Although it was sad to witness this, there was an abundance of them all over the islands, and very interesting to see the natural selection process at work here on these infamous islands. We then got back on to the boat and settled in with a few beers on the sundeck. We had been told by our crew that we were passing the equator line, marking the middle of the earth, so along with our cruise mates we went to watch the GPS navigator hit 0.00.000 and counted down as if it was New Years eve (amusing at the time!). It was a little bit of an anti-climax, but on the plus side we get to say that we've sailed over the half way mark of the world. We then settled down for dinner and briefing before heading to bed for an early night. The next morning we had arrived in Egas Port on the Western side of Santiago Island. After a short dingy ride we arrived on a black sand beach and made our way over to a spot that was famed for sighting the Galápagos fur seal. Both the fur seals and sea lions are from the ‘eared seal’ family, however we were told that the noticeable differences of fur seals include thicker fur, larger ear flaps, different head proportions as well as being much smaller. After a 5 minute walk across the rocks we spotted about five fur seals dosing or trying to find themselves a good spot. They seemed far more docile than the sea lions and their thicker fur and large eyes made them seem more like friendly puppies! After half hour or so we headed back to the beach and grabbed our snorkels. We had left the colder currents behind and didn’t need a wetsuit, so we eagerly jumped on in. As there was no sand the water visibility was great, revealing shoals of tropical fish including parrotfish, puffer fish and we even had a white tipped shark swim less than a meter past us! After 45 minutes of snorkelling we headed back to the beach and basked in the sun before heading back to the Eden for our mid morning snack. Our next stop was Rabida, an island known for it’s striking red-coloured sand. After lunch we moored up close to the shore and took dinghies to the beach where we spotted a group of sea lions resting on the red sand. The island was deserted apart from our group, so after taking a stroll along the beautiful beach to see the sea lions we cut inland and wandered past a small turquoise salt-lake and uphill to get a view of the tranquil island from above. It didn’t take long before we were rewarded with a beautiful view of the unusual red, white and green landscape covered in cacti. We spent a final hour or so sun bathing on the beach until it was time for us to head back and set sail to our final destination. As we cruised onwards we heard the crew shout excitedly, as apparently they had spotted a huge sunfish. We all peered over the side of the boat to get a glimpse at the oceans largest bony fish; we just wished we had been able to get a better look! After the excitement we grabbed a beer and watched the sun slowly descend over the volcano in the distance then congregated near the bar and made a toast to our fantastic crew and guide for an amazing 5 days. As it was our last night of the cruise we stayed up drinking beers and chatting with the other guys for as long as we could. Our final morning was an early one, as the best bird activity was at sunrise so around 5.30am we sleepily huddled onto the dingy and headed for North Seymour Island. Even before landing the noise of the birds was amazing. After getting on land we noticed the sheer number of different birds in the area, including the iconic blue footed booby, a bird which was top of our list to see on the Galapagos. There were hundreds of couples nesting, and it was great to witness them performing their typical blue-footed dance and whistling to each other. We wondered further around the coast, taking in the various birds all around us including lava gulls, with vibrant red-ringed eyes, and magnificent frigate birds with their iconic inflated necks. Their red throats were simply amazing, and the noise they made as they banged their beaks against them echoed across the shore. Their were also lots of chicks dotted around and being fed by their parents; it was a real privilege to be on such a vast nesting site with these beautiful birds. After taking pictures and watching for a short wile we were reluctantly directed back to the dingy, marking the end of our incredible 5 day cruise. We were dropped at the airport where we said our goodbyes to half of the group and then made our way back for our last day on Santa Cruz. After checking back into our hostel, we made plans with our cruise mates for the evening and by 7pm we were reunited again on 'cheap street' for the last dinner. We had made good friends with the other three couples, so it was great to share one final meal together. The next morning we headed off early to the airport barely able to believe what we had experienced over the past two weeks. 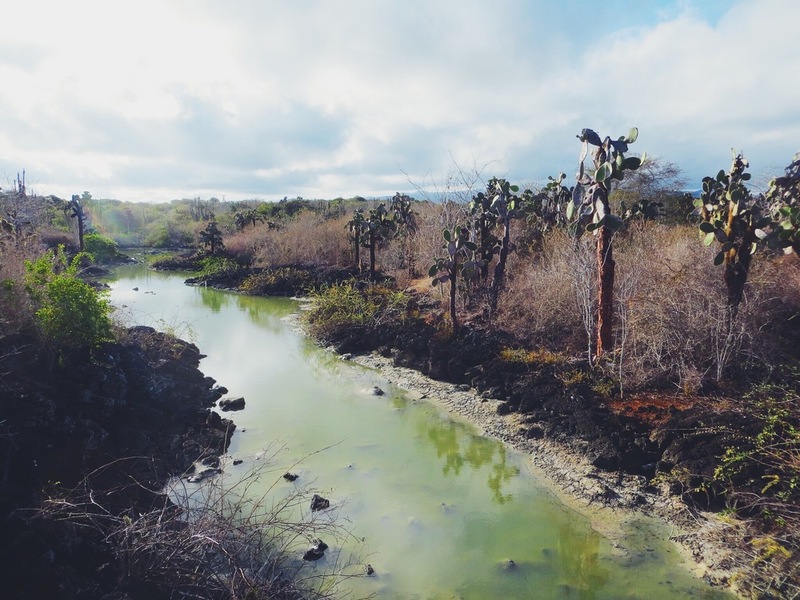 We had set high expectations for the Galápagos Islands, and with such big costs and planning needed it's easy to see why many might find visiting the islands too much during a longer trip. However, the six days we spent diving and exploring Santa Cruise by ourselves had been incredible, and the guided cruise had been everything we'd hoped and more. We came away feeling we had really made the most of our time there, and experienced things that we will remember for the rest of our lives. 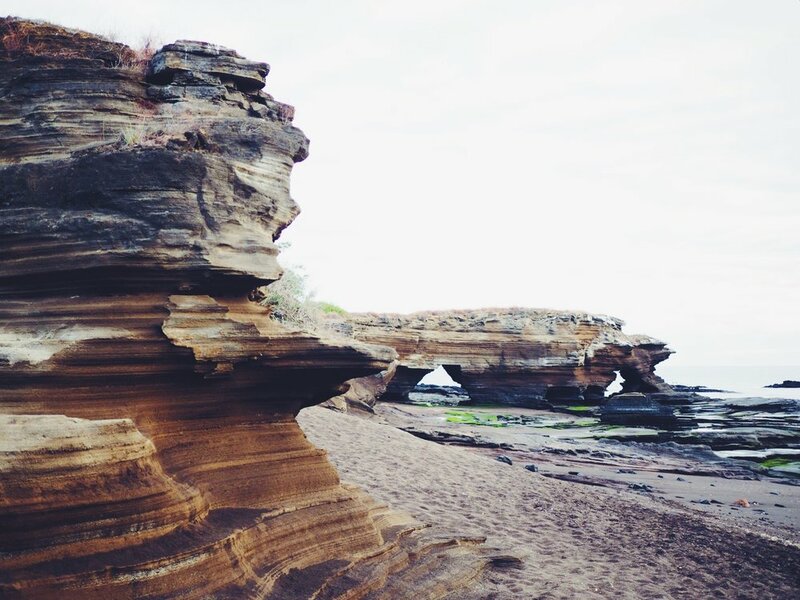 Our advice would be to believe the hype, save the cash and put the Galápagos Islands on your bucket list, you won’t be disappointed! 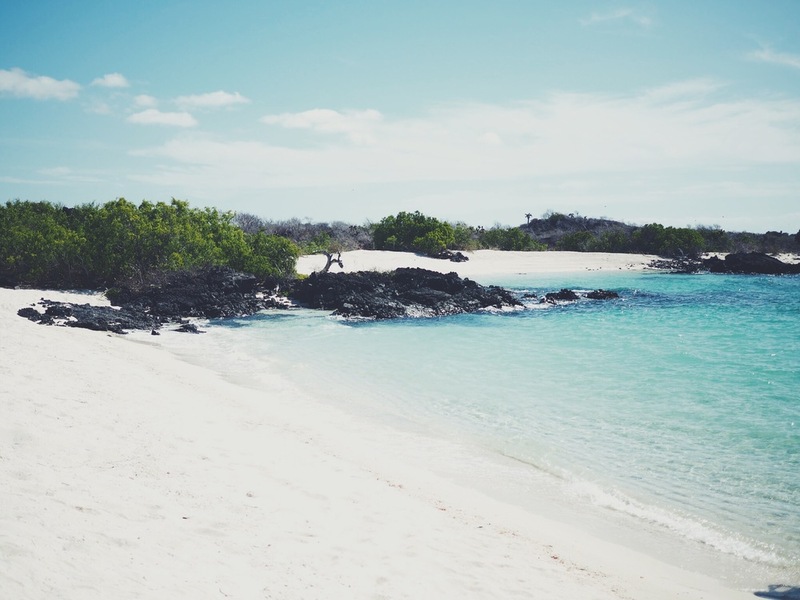 The Galápagos Islands were positioned firmly at the top of places we wanted to visit in our lifetime. Being the birthplace of Darwins theory of evolution, and with the sheer quantity of endemic species on the numerous volcanic islands, it was somewhere that we had dreamed of going to for quite some time. We had saved for an extra year in order to include it on our trip, and having heard friends and other travellers talk about it as the best place they've ever visited, we certainly had high expectations. Planning for such an experience, especially last minute as we'd been advised to do to keep the cost down, did not come without a little stress. We spent a few days downtime in the small beach town of Mancora in Northern Peru to plan and research the things we wanted to see and do to maximise our time and money. Due to our flexibility with dates and times, we managed to find a cheap flight a month in advance (almost half the price by using an app called Hopper) from Guayaquil, the largest city in Ecuador located in the South. Our flights gave us a total of 12 days to explore the islands, allowing us enough time for both a 5 day cruise and to organise our own day trips and dives from the main island, Santa Cruz. There was obviously a catch to our cheap flight – an uncomfortable 9 hour layover and sleep on the airport floor in Quito – before getting our second flight to the islands. We arrived at Baltra Airport at 8am on a small island off the northern tip of Santa Cruz. It took us around an hour to get to the main town of Puerto Ayora (two buses and a short ferry ride) and once we had arrived we scoped out a few hostels for a cheap room. We'd read that there was no need to book accommodation before arrival, and it would be cheaper not to, so were relieved to find a nice private room with a fan at Liori del Mar hostel in the centre of town for around $15 each per night. After arriving in Puerto Ayora and getting a room our first port of call was to head to the bank to pick up some dollars (the currency used in Ecuador). By the time we'd got money out, we had already bumped into a few sea lions, seen many marine iguanas, red Sally light foot crabs and a couple of turtles had even popped their heads out of the water in the harbour. Continuing through the town we stumbled across a small fish market where sea lions and pelicans were gathered around the stand trying to catch the scraps thrown by the local ladies. We had expected to see lots of wildlife during our time in the Galápagos islands, but having seen around 4 different types animals without even trying we knew we had arrived somewhere extremely special. That evening we grabbed a beer and headed to the main pier to watch the sun set. Much to our delight the benches had been taken over by sea lions, and so we sat next to them as the sun descended into the horizon. As it went dark, the underwater pier lights turned on, illuminating the abundant marine life below. Among them were hundreds of baby black-tip reef sharks, sea lions darting around the pier pillars and even a large eagle ray surfaced briefly showing us its amazing spotted patterns. It was pretty much like being in an aquarium! After an hour or so watching life on the pier, we started to get hungry and so headed to the centre of town for some dinner. We had been told to avoid the ‘gringo’ restaurants on the main strip, and so a few streets back found Charles Binford Street (which we named ‘Cheap Street’) where the prices were a lot lower and the food was far more rustic. On arrival we found rows of small fish restaurants with tables that spilled out filling the entire street. We wandered down to have a look, and picked one that took our fancy. Most of the places served fresh dishes for $5-$10, which was great value for the Galapagos. We ordered some grilled fish, rice and potatoes and a large beer, and enjoyed the bustling ambience of the street. 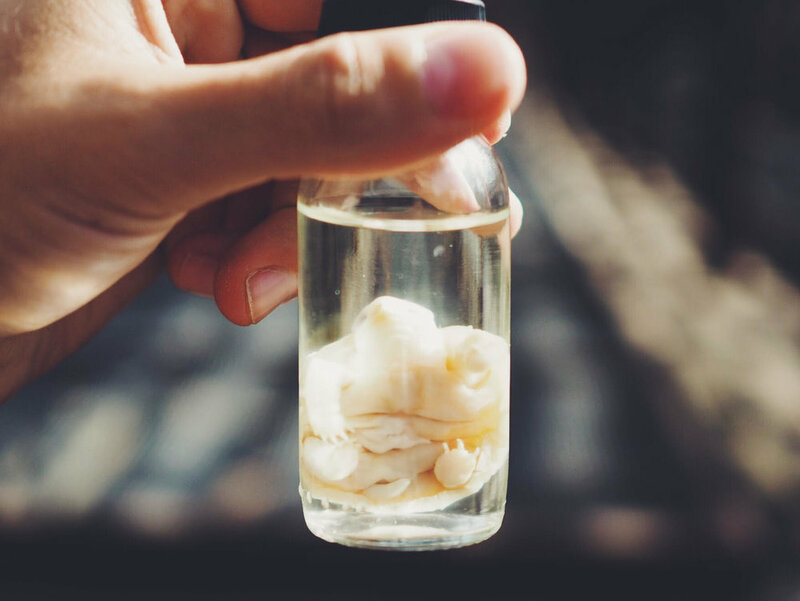 We had heard that the Charles Darwin Research Station, located right next to the town, was a little underwhelming, but we wanted to visit anyway to make our own minds up and see what was there. The following day we headed down the dusty path and arrived at a series of buildings that made up the centre. 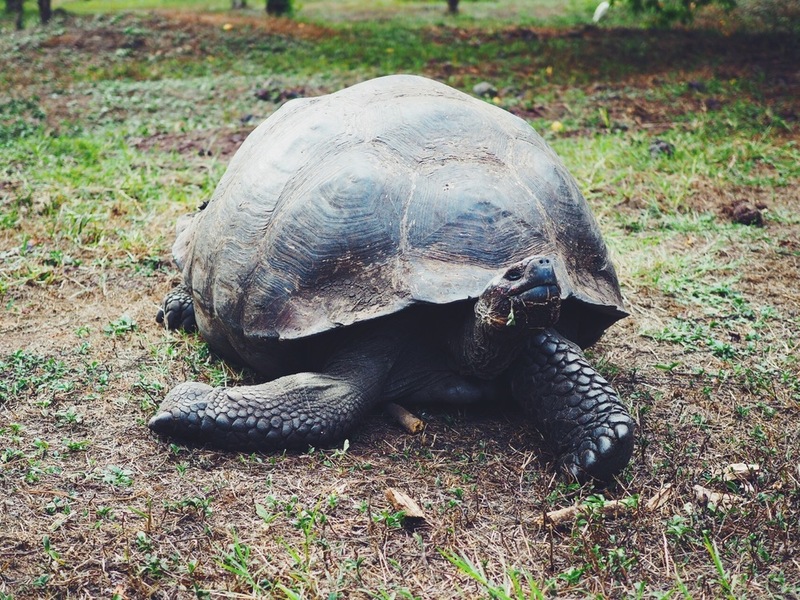 The reserve had been home to the late ‘Lonesome George’, the last remaining giant tortoise of his sub-species from Pinta island, the rarest species on earth. He was a symbol of the importance of preservation of endangered species, but despite breeding efforts George sadly died in 2010, marking the end of the Pinta Island tortoise. We learnt that during the 18th and 19th century pirates had kept the giant tortoise’s aboard their ships for food (as they lived for months), killing more than 200,000 by the late 1900s, and was ultimately one of the main reasons for the loss of the Pinta Island tortoise. After leaving the main building we headed up a short path to the tortoise reserve where a breeding program had been set up for various endangered species. On arrival we spotted a small walled enclosure where 3-4 Giant tortoises were feeding on lettuce leaves. It was great to see the giant tortoises for the first time but, but we had heard it was much more special seeing them in the wild in the central highlands of Santa Cruz, and so didn’t spend too much time there. We wandered around for a few more minutes to see the rare yellow Galapagos Land Iguana, before heading back into town via the small but picturesque sandy beaches on the way. Visiting some of the Galápagos many beautiful beaches was something we had been eager to do since arriving, and being in walking distance from the town, Tortuga Bay was the obvious choice. After picking up some empanadas for lunch we set off on the 40 minute walk along the path laid over a sea of cactus plants and vicious looking volcanic rock toward the beach. At first the walk seemed fairly uninteresting, but as we looked closer we noticed many varieties of cactus finches, ground finches and tree finches in the surrounding branches. Although the birds looked fairly uninteresting, knowing that these birds and their beaks sparked the theory of evolution made them really interesting to spot. After over half an hour of walking in the heat we finally arrived at a breathtaking stretch white sand, with turquoise water, crashing waves and black volcanic boulders dotted along the beach. As we strolled along the perfect soft white sand with the blue reflection of the sky over the wet sand, we both agreed it was probably the most beautiful beach we'd ever seen. We were in paradise! After an hour or so exploring the wildlife around the beach, from birds to marine iguanas we waded through the clear, cool water towards the right side of the beach. To the right side of the beach we came across a small pool of water that had been trapped by the outgoing tide, and looking closer we noticed it was filled with many juvenile tropical fish. It was the perfect snorkelling spot! At the end of the main beach we walked a little further to find a smaller lagoon which was equally as picture perfect, a calmer expanse of water surrounded by mangroves. After finding a quite spot to for lunch (and being hounded by greedy finches!) we spent an hour or so snorkelling around the mangroves. Unfortunately the visibility was pretty murky and therefore difficult to see anything, but once we got in the shallows we saw a baby black reef tip shark approach the shore, and even spotted a baby sting ray as it fed in the shallow water. As the sun began to set we headed back toward town and picked up some beers and headed back to our favourite spot at the pier once more. 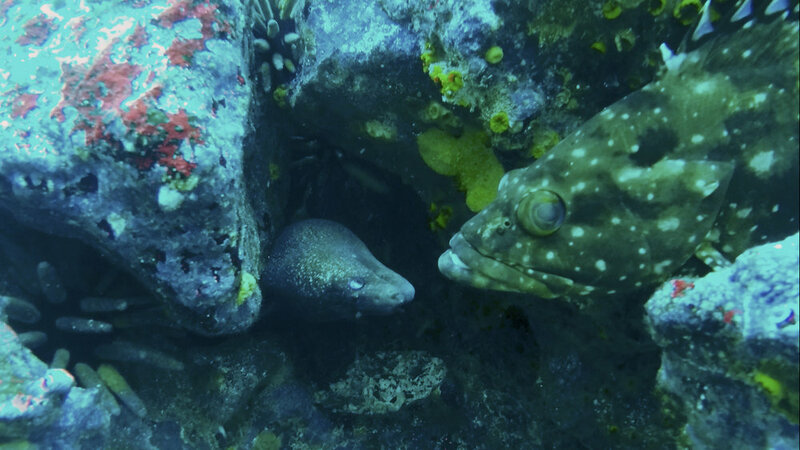 The Galapagos is known to have some of the best diving sites in the world, and so we felt we had to include at least 1 or 2 dives during our time there. The most special dive sites, Wolf and Darwin island are accessed only by 7 day dive trips, and well out of budget, but the sites around Santa Cruz are still considered to have fantastic diving. We wandered around a few of the dive outfits in town to find out the best deals and spots, and settled on visiting Seymour Norte & Mosquera, just north of Santa Cruz. We left around 7am in a jeep to get the the docks in the north of Santa Cruz, before setting off on our dive boat with 8 others. After being briefed by the dive master and kitting up, we jumped off the boat and began our dive. Within minutes we were surrounded by schools of colourful tropical fish, and once at the bottom we saw many white tip reef sharks in the area. The visibility was pretty good, but unfortunately our camera couldn't pick up the main sightings of the dive - spotted rays and around 6 hammerhead sharks! Our second day of diving was at Gordon’s rocks, a dive famous for its large shoals of hammerhead sharks. After seeing them on our last dive it was far too tempting to try and see them again in their masses. After another early start and a 40 minute boat ride we reached the two large rocky islands and were briefed about the topography of the dive. The current was pretty strong (apparently it was to do with the full moon) but the visibility was slightly better then the previous dives. During the dive we saw more huge spotted eagle rays, sting rays, sea lions, turtles, lots of fish and one hammerhead. It was slightly disappointing to not experience the large school of hammerheads, however, with such abundance of marine life it was still a really memorable experience. Pinzon is a popular island for snorkelling, reachable by boat about 3 hours wast of Puerto Ayora. After speaking with a few agencies in town, we booked up a day tour and met with a group of others by the main docks. We boarded a small speed boat and headed towards the island, passing interesting rock formations as we went. About half way through the journey, the guide and crew shouted and pointed to the fishing rods, as apparently there were fish to be caught in the area. The crew cast out two thick sea rods with large lures, and chugged the boat along slowly to keep the bait at the right depth. About 5 minutes later, the line started to fly out of the reel with a loud whizzing sound, and one crew member asked who wanted to take the fish in! 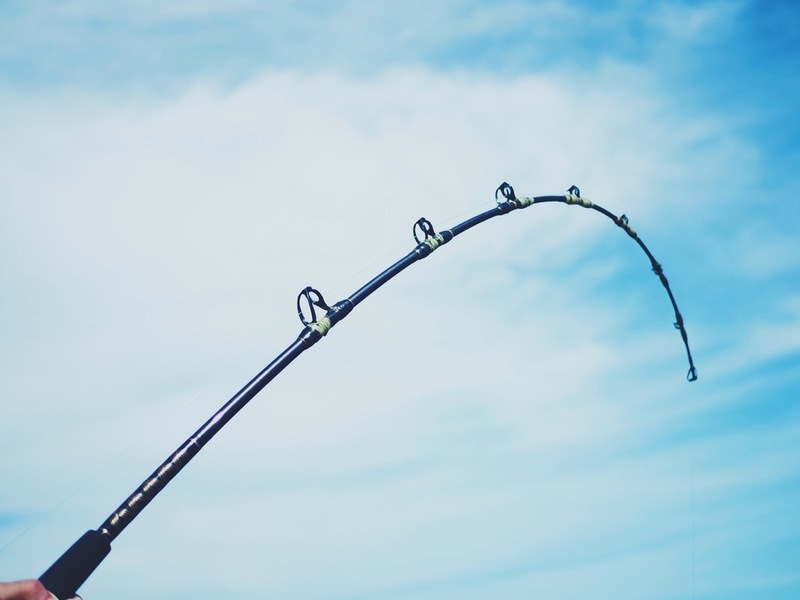 A broad Argentinian guy who was apparently a keen fisherman looked up to the task, and grabbed the rod, was strapped in with a waist belt and proceeded to tire out the fish. The rod was bending massively under the strain of the fish, meaning something big must be on the end! After 10 minutes of heaving in the rod and feeding the line back on the reel, the fish finally emerged near the surface with a bright flash of colour - it was a huge yellow-fin tuna! A crew member grabbed the gaf and skillfully hooked the mouth of the huge fish, and pulled it up to the side of the boat. 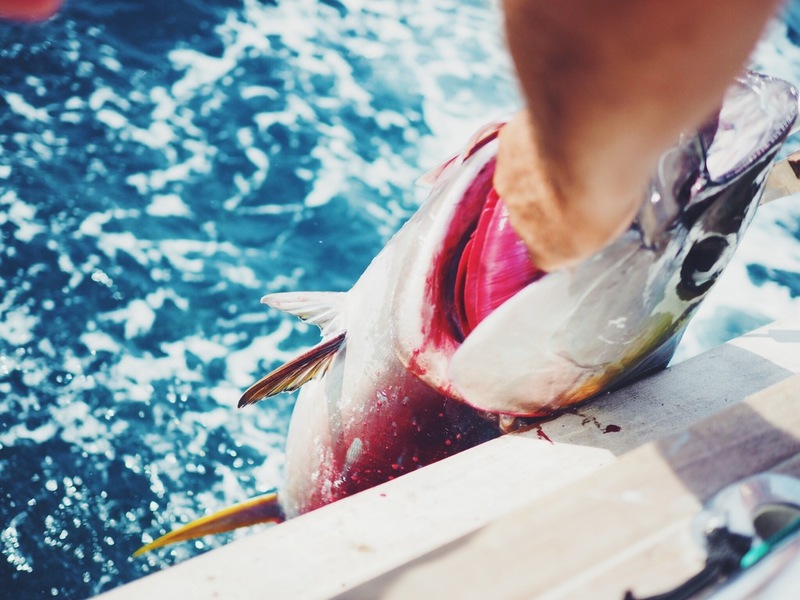 They quickly put the fish out of its struggle with a knife in the head, and after a few minutes they were able to pull it onto the deck. It must have been at least 60 pounds! By chance there were a group of Japanese guys on our boat who were kitted out with seaweed rolls and soy source, and so after the crew masterfully sliced and filleted the fish they brought out a plate of immaculately fresh sashimi for us to share. It was absolutely delicious, and definitely the freshest fish we'd ever eaten. We then moved on to a snorkelling spot that was renowned for penguins and turtles. The water was much calmer and shallower, meaning the visibility was perfect. Once we jumped in we realised there unfortunately weren't any penguins there, but were many turtles swimming around, and we managed to get really close up to them without them wanting to swim away. 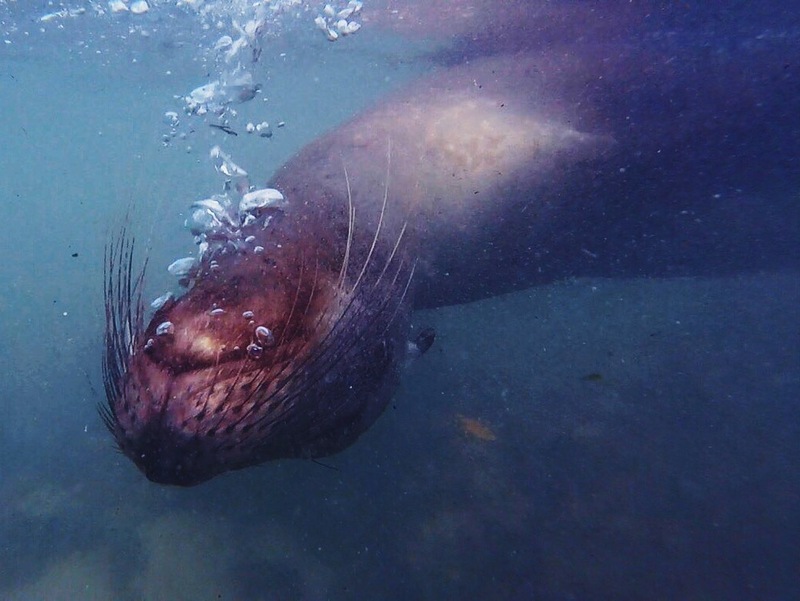 There were also a number of sea lions who would playfully circle around us and blow bubbles. It was a great snorkelling spot, and allowed us to get some great footage. We ended the tour at a small secluded beach called Las Palmas, where we were able to lap up some sun and chill for a while after an action-packed day. 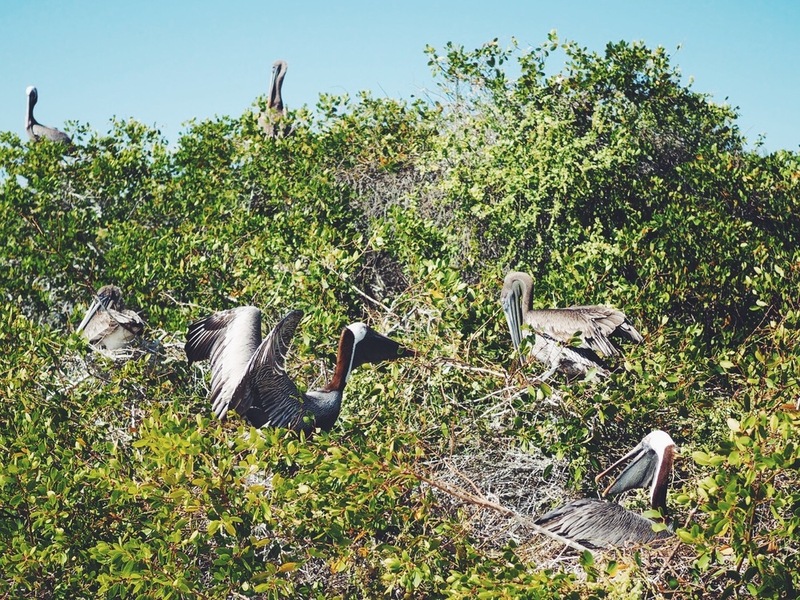 Walking to the left of the beach we stumbled across a tree filled with nesting pelicans. It must have been a prime spot for them as there were at least 10 in the same tree, and we spotted couples taking it in turns to collect fish and bring it back for their young. After an hour on the small beach we boarded the boat for the last time and headed back to Santa Cruz. We had one last day to fill before our cruise, and so we decided to take a tour close to Puerto Ayora visiting Las Greitas and Academy bay. As we pulled out of the harbour we spotted many sea lions lounging on the boats, but once we reached the 'Sea Lion Island' there was not one to be seen! (they must have all been fishing!). We then left and came to spot where some Galapagos sharks were lurking in the water, and as we peered over the side of the boat we could see their large brownish shadows passing under the boat. After stopping at a spot close to the cliffs we then put on our snorkels and jumped in. There were a number of brightly coloured fish around, but the real highlight was coming across a giant turtle in the clear and shallow water. He was, as most creatures here, completely unphased by us and we spent over an hour swimming and diving down with her which was a really incredible experience. 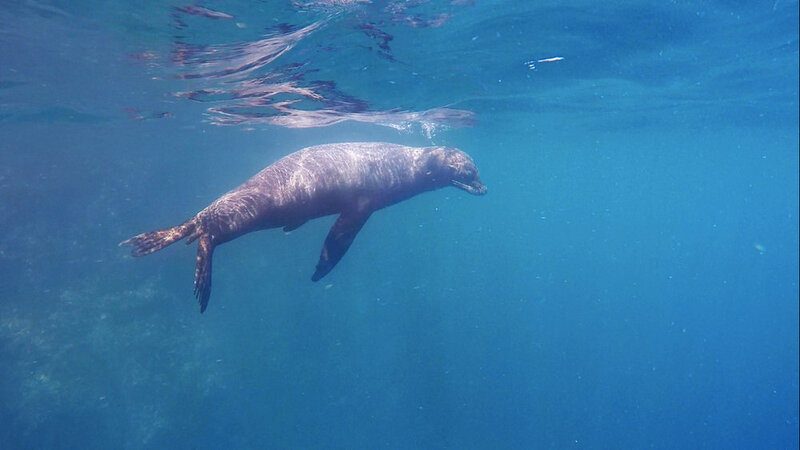 The next part of the tour was to visit the marine iguanas, but knowing we were about to see thousands on our tour we decided to stay with the captain and try and swim with the few sea lions that were about. We swam up to the little white sandy beach where we saw a mother sea lion basking in the sun. We then turned around and saw her pup swimming towards us so we slowly approached the water, knelt down, and she playfully popped her head out of the water right in front of us! She turned back to the deeper water and we spent an incredible 10 minutes snorkelling with her as she twisted and turned around us - it was total magic, and an experience we will remember for the rest of our lives. Our boat then took us to another pier, where after a short walk past some salt flats we arrived at the popular swimming spot, Las Grietas. 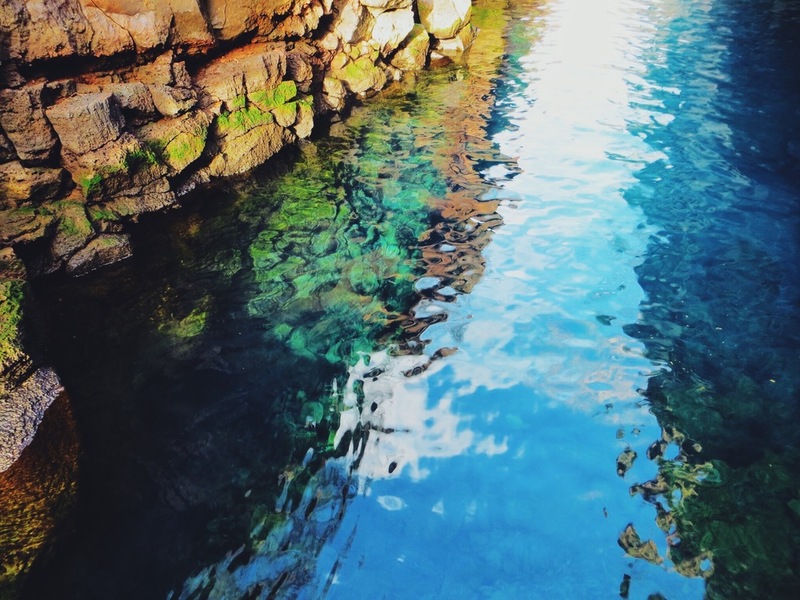 Las Grietas is a deep, narrow canyon filled with crystal clear water, and a perfect place for a refreshing dip. After diving in and cooling off we had a lot of fun messing around with the GoPro in the incredible blue water, and we even spotted a few colourful fish as we dived down into the surreal sun-lit water. By 6pm the guides said it was time to leave, and so we headed back to the boat and watched the sea lions jumping out of the water around us we headed back to the town. Next on our list was to see the giant Galápagos tortoises in the wild. The iconic species live in the Santa Cruz highlands, right in the middle of the island where the weather is wetter and with more vegetation. We took a 4x4 collectivo (shared taxi) with two other couples to reduce the cost, and headed to the 'Rancho Primitas', the reserve for giant tortoises located about a 25 minute drive from town. The temperature and landscape changed quite drastically as we ascended to the highlands, with dense cloud covering overhead and lush green trees and tropical plants becoming thicker with each kilometre. On arrival our taxi driver explained that he would give us a free guided tour of the reserve, which we were happy to take! It was amazing seeing these giant, primitive beasts in the wild, and as expected they were absolutely massive! We watched them slowly strolling around in their natural habitat and had fun taking pictures with them as they feed on leaves from the surrounding bushes. We then approached a big pond where there must have been at least thirty tortoises wallowing near the waters edge, and we could hear them gargling and grunting as they shuffled around to find the perfect spot for a mud bath. Our taxi driver (and guide) then walked us to some huge lava tunnels not far from the pond. 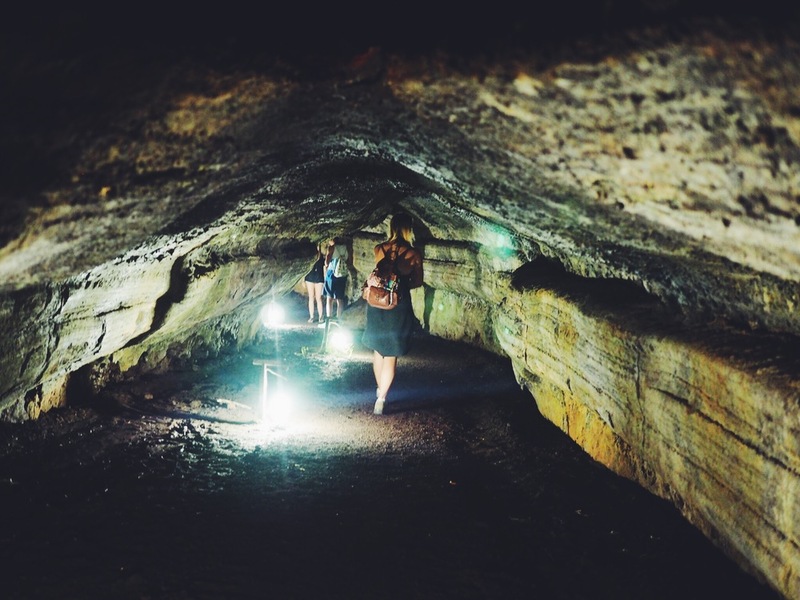 The tunnels were very dark and it was very cool walking through them knowing that they were once flowing with liquid magma from volcanoes that erupted thousands of years ago. We ended our visit trying on some of the tortoise shells in the cafe. Getting inside them really highlighted how giant these tortoises are, and the shells themselves were a lot heavier than we expected! 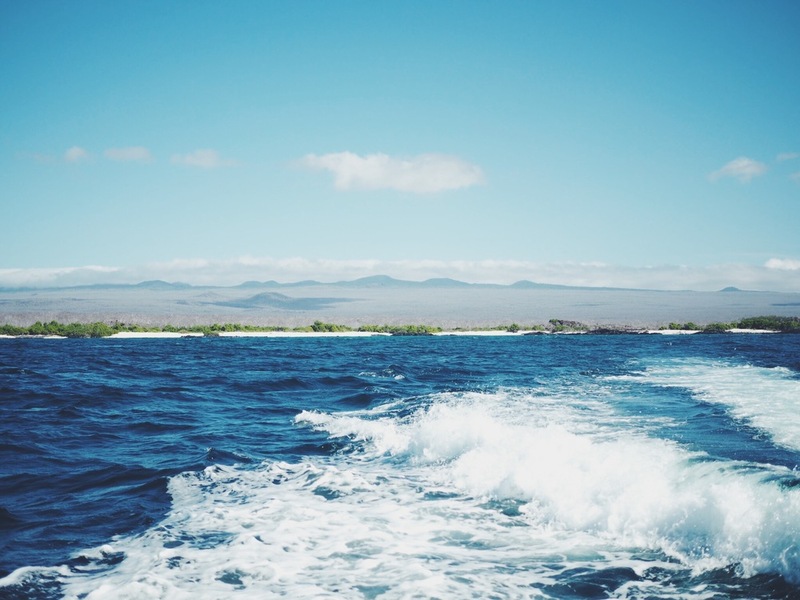 Our first glimpse of the Galápagos islands were as beautiful and nature-filled and as we had hoped for, and after only 5 days we had already been completely blown away. Although the tours from Santa Cruz were fantastic, we were really looking forward to seeing the other side of the Galápagos Islands, away from the reach of day tours, where the more remote and secluded parts of the islands where even more removed from human contact. Our boat had arrived in Santa Cruz that morning so by 6pm it was time for us to join the cruise. Excitedly we made our way to the harbour for our 5 day adventure around the islands of Isabella, Fernandina and Rabida on the western side of the Galápagos Islands.